The player reportedly being investigated for allegedly marking cards and cheating in the 2015 World Series of Poker $10,000 Heads-Up Championship denies it all. The player reportedly being investigated for allegedly marking cards and cheating in the 2015 World Series of Poker $10,000 Heads-Up Championship has denied it all. After earlier attempts to contact Moldavian Valeriu Coca, PokerNews was able to speak with him through an interpreter while he was at the cash game tables inside the Pavilion Room at the Rio Convention Center. Coca, who finished fifth in the event, said the allegations being levied against him are simply sour grapes. "This is a fantasy," he said, laughing. "The players who lost are very good, so they just don't believe they could lose to me for an honest reason." Coca beat Matt Marafioti, Pratyush Buddiga, Aaron Mermelstein, Connor Drinan, and Byron Kaverman before losing to eventual champion Keith Lehr in the Round of 8 on Wednesday. Early Thursday morning, Drinan took to the TwoPlusTwo forums alleging he and the other players had been the victims of a cheat. Drinan further elaborated in an interview with PokerNews, saying Coca played perfect against him, folding when he had it and applying pressure when he didn't, taking strange lines, and asking to see his chips time and time again. Drinan also claimed he discussed the situation with the other players Coca had played against and they all agreed something strange was afoot. As a result, several players approached WSOP officials, and on Thursday, WSOP Tournament Director Jack Effel, WSOP Vice President of Corporate Communications Seth Palansky, and WSOP Executive Director Ty Stewart all confirmed the WSOP was taking the allegations seriously and conducting an investigation. Palansky also claimed preliminary testing of the cards show no markings or use of any foreign solution, as Drinan and others had suggested might be the case. Coca claims the WSOP has not informed him any investigation was being conducted and he has already collected $54,545 in fifth-place money. "I don't even know how they think this is possible," he said. "I have no way of marking cards or any other tricks." Coca said he was aware of the accusations in the forums and said they represent poor etiquette on behalf of the players posting there. "This is not gentlemanly, to lose and cry foul," he said. "They are not gentlemen. They lose and they think they must have been cheated. They are just looking for a way to explain why such strong players would lose to a much weaker one." Coca went on to liken the situation to that of Russian chess masters Anatoly Karpov and Garry Kasparov and a time when one called the other a bad player, and the reply was he may be bad, but he was better than him. He also said he welcomes the investigation as it will surely prove he's done nothing wrong and he plans to continue to play several more events at the 2015 WSOP. 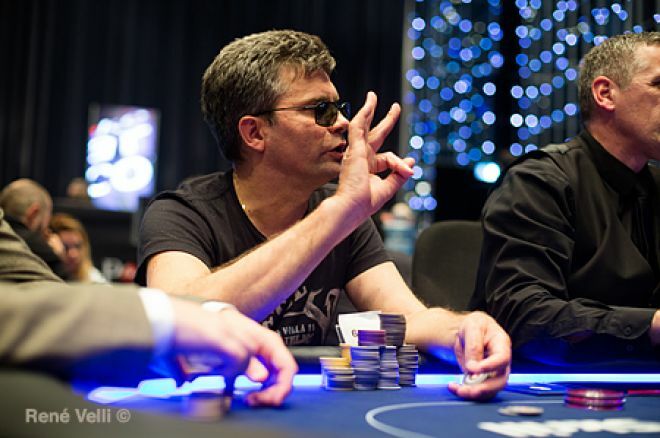 PokerNews also spoke with Czech poker writer Martin Kuchařík and Tony Felfel, the former manager of the Ambassador Casino, who claimed Coca had been caught marking cards, labelled a cheat in Prague, and barred from major casinos there. Coca also denied these allegations, claiming he had simply been barred from playing roulette in one Prague casino after being labelled an advantage player. *Image courtesy of the EPT.